Why advertise a product, band or sports franchise on your t-shirt when Japan's Ito Manufacturing offers an expensive, expressive & eccentric alternative? 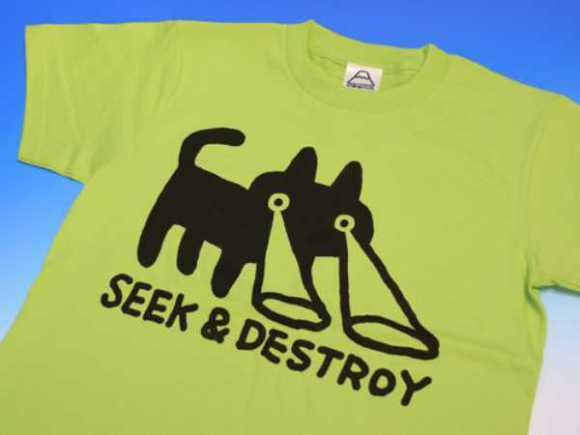 “Seek & Destroy” 100% cotton t-shirts in Grass Green and Cloud Gray plug you into a rarefied region of social consciousness where mass market consumerism takes a back seat to a black cat with death-ray eyes. This cat's got your back in more ways than one: it features two different sides of the story, one for the front and one for the back. Unlike boring old logo t-shirts, “Seek & Destroy” lets the wearer and the watcher decide the true meaning of the graphic design. Is the black cat mean and malevolent, or merely mischievous? Who can say? 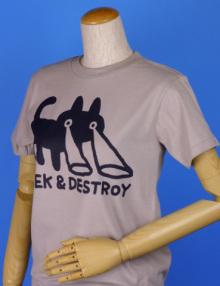 Like its insufferably sweet Hello Kitty cousin, this shirt's cat has no mouth. Like the iconic Metallica tune it possibly references, the actions of the cat seem to be a quick & easy exploration of an uncontrollable murderous urge: the cat seeks, with some sort of x-ray enhanced vision, and (on the back of the shirt) it finds its quarry – a snake – and proceeds to destroy it like an ant under a magnifying glass on a sunny summer day... or does it? Take a closer look at that snake: it's smiling! Could the cat merely be in a playful mood and the supposed terrifying heat beam merely a sort of tickle ray? We don't know and Ito Manufacturing's not telling. “Buy the shirt and figure it out”, seems to be the only obvious message. Will you fall for Ito Manufacturing's nefarious scheme to pick your pocket of 3,360 yen (about $42.50, yikes! ), or will you go on wearing t-shirts stamped with “Property of New York Giants” or a faded Bud Light logo? Which t-shirt would best impress that cool guy/gal you've had your eye on? Try and figure that out as well while you browse the Ito Manufacturing website. Will The NOOK Become The Best Audio Book App For Android? Prius Neighborhoods Found at Twitter, Facebook & At The Pump!